Here are some of my favorite Pinterest looks. Kudos on the style pinners! 1. This outfit embodies everything I try to accomplish when getting dressed. 2. Love the use of pastels. 3. So cute and sophisticated. 4. Neutral and I love it. 5. Perfect for casual Friday. 6. Love the coral and navy combo. 7. Can you tell I'm obsessed with navy right now? 8. How cute would this be for shopping while on vacation? 9. 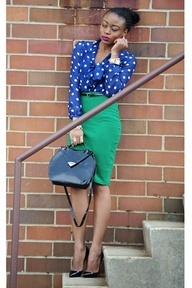 Die for this green dress and those Sam Edelman pumps. 10. Every girl needs this outfit.